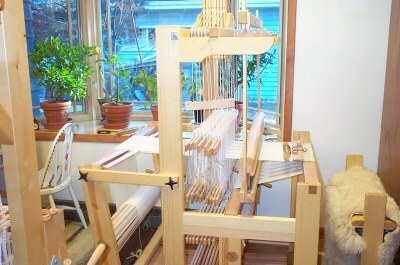 Click here for a demonstration of the DutchMaster Loom. The Woolgatherers, maker of the DutchMaster Loom and "Cobbler's Stools" for spinners are proud to announce the addition of several new products to our offerings for spinners and weavers. We offer only quality items that we know to be effective weaving and spinning tools. Our specialty will be equipment sized for the modest home or apartment. Click here for a demonstration of the Lilla in action. A unique offering for countermarche looms. 8 shafts, 8 treadles standard. 41" deep. 32" and 40" weaving width. Vertical countermarche. Folding back beam saves 12" when not in use. Excellent shed. Can be expanded into a drawloom later. Unique offer - I have an electrified cold mangle that presses your fabric between two rollers with 800 pounds of pressure. Fantastic for all fabrics that need a smooth surface. Puts an unbelievable finish on white on white linen patterns. Prices are net. Wisconsin Residents pay 5% Sales Tax. Shipping not included. We accept cash, personal checks and money orders. Bluster Bay Super Slim 12"
These are based on the custom, variable depth extension made for my loom by Myrehed in Sweden. Designed specially for the Lilla frame. It is a full height extension that can be adjusted to a shorter depth when needed. Can be made by any good woodworker. This extension does not connect directly with the drawbridge console, so could work comfortably with draw attachments from other sources or a home built. Try one and see how it improves your weaving – guarantees a firm beat at the fell line across the entire reeded width, where it is most important. New title, excellent instructions on making knotted pile carpets. Excellent guide to setting up and balancing a countermarche loom. For any brand or model. Clear , concise instructions for warping both counterbalance AND countermarche looms. Not brand or model specific. Laila Lundell - "Big Book of Weaving"
EXCELLENT comprehensive book on weaving. Covers countermarchej AND counterbalance looms. Even if you have been weaving for a while, this book will be very helpful.